Throw-in at Croke Park is 3.30pm on Sunday. 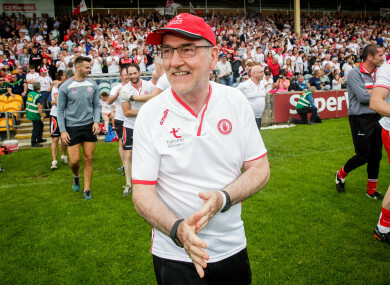 TYRONE MANAGER MICKEY Harte has made one change to his starting 15 as they prepare for their All-Ireland semi-final showdown against Monaghan on Sunday. The Red Hand travel to Croke Park (throw-in 3.30pm, live on RTÉ / Sky Sports) off the back of a huge 2-17 to 1-13 win over Donegal in Ballybofey last weekend. The impact of the bench was crucial on the day and the first man called to action was Rory Brennan after just six minutes as Michael McKernan was shown a black card. The Trillick defender has been rewarded for his efforts with a start this week. He comes in at corner back with half-forward Conor Meyler the player to make way in a reshuffle. McKernan starts in the other corner, while there’s no room for Lee Brennan — who scored 0-4 when he came on the last day — nor goalscorers Kieran McGeary and Harry Loughran, both also impact subs. Email “One change as Tyrone name side for All-Ireland semi showdown against Monaghan”. Feedback on “One change as Tyrone name side for All-Ireland semi showdown against Monaghan”.